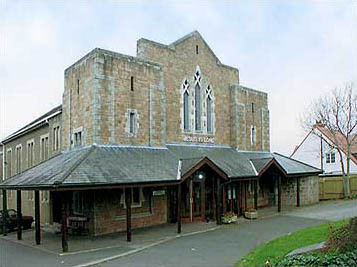 The church: Emmanuel Baptist, Falmouth, England. The church: This church is very friendly. The only way to avoid being engaged in conversation would be to feign dumbness – otherwise someone is bound to talk to you. The neighbourhood: It's at the top of the hill in the town, which is bad news if you live at the bottom and have to walk up! The cast: The worship was lead by Barry Woodward. Charles Blizzard handled the teaching ministry. In the porch, we were given a handshake and a friendly "Come in, welcome." Once inside, the welcome was more restrained. During the sermon, someone behind us noticed we hadn't brought Bibles, and asked if we would like one. The chairs were metal with upholstered seats and backs, of the sort you often see in hotel conference rooms. They were much more comfortable than the cheap plastic variety. The atmosphere was very casual, with contemporary music playing on the PA system when we entered, and again when we left. "Good morning, a warm welcome to all." A service sheet with notices on one side and sermon notes on the other. All the songs were on an OHP. Some church Bibles were available in the pews. A band comprising drums, keyboard and three other musicians, along with a substantial mixing desk. The layout was well planned, with the musicians at the side and the sound equipment towards the back. A noisy toddler early on in the service. The church was bare, with very little to gaze at – there were no pictures, statues, plaques or stained glass windows in view, but a few banners brightened the place up. The worship was casual, but not unprepared or disorderly. Those who led the service were dressed informally – no dog collars or ties here. Songs were on the happy clappy side at first, but more meaningful music followed. The worship had a spontaneous feel to it: songs were started impromptu from the congregation at least once, someone soon found the words for the OHP and the band played along. The sermon was based around Amos Chapter 5, one of the more obscure bits of the Old Testament, in which we are instructed not to go to Bethel, Beersheeba or Gilgal. The preacher discussed what the three places would have meant to Amos and his contemporaries – their significance was in Israel's history, and the message that God was trying to give through Amos. According to the sermon notes, Israel was resisting change and transformation. These notes included "Points to Ponder" for those who wanted homework. The informality and friendly welcome, along with the good music from the band, made us feel at home. The atmosphere was quite similar to our own church. The sermon was informative and well presented. Having to sing a meaningless song through three times. This is a very friendly church – it was impossible to escape without people talking to us in a friendly fashion and telling us what else was going on. One of our party hates talking to anyone, but even he succumbed to the welcome. Unfortunately we had to rush off, but at the front of the church there was a welcoming sign and all were invited to stay for refreshments. 8  There was a wide mix of ages, and although the church aims at families, students will feel welcome here too. Those seeking a quiet, reflective, sacred atmosphere may wish to go elsewhere. Celebrities wanting a quiet life incognito would also be advised not to go unless wearing impregnable disguise and false voice, as otherwise they would be outed by the welcome. Yes. We felt part of their family. The impossibility of attending unnoticed.